So far, we’ve used this blog to introduce Boston-area patients to some of the best services available at Boston Smile Center, but one we haven’t said anything about yet is also one of the most effective of all. 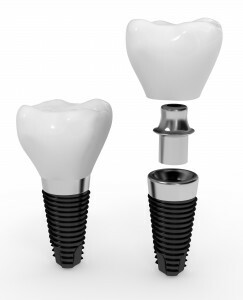 We’re talking, of course, about dental implants. With this post, and the one you’ll see two weeks from now, we’d like to spend some time talking about what dental implants are and how Dr. Sasson can use them to restore your smile. Before we talk about what dental implants are, though, let’s talk about what happens in smiles that don’t have them. When you lose a tooth, regardless of the reason, you end up losing more than just the tooth; you also lose the root that anchored it to your jaw. That, by itself, doesn’t sound important, but it is. Besides anchoring your teeth, your roots also stimulate the growth of new bone tissue in the jaw, keeping your entire smile strong and functional. When one of these roots goes missing, the jaw weakens, creating a ripple effect that can result in the loss of other teeth. Dental implants are designed to prevent this from happening by replacing more than just a missing tooth—they also replace your missing root. But we’ll talk more about in our next post. For now, if you’d like to learn more about dental implants, you can visit our dental implants page or call Dr. Sasson’s Boston implant office to schedule a consultation visit. During a consultation, Dr. Sasson would be happy to talk more about the dental implants process and can help you find out if you’re a candidate.